The item A magical surprise / [adapted from the story "A magical surprise" in More-5 minute princess stories by Lara Bergen ; illustrations by the Disney Storybook Artists], (electronic resource) represents a specific, individual, material embodiment of a distinct intellectual or artistic creation found in Lawrence Public Library. It was a lovely day in Agrabah as Jasmine sat in the palace garden with her pet tiger Rajah. There was just one thing missing: her husband Aladdin! She liked spending time with him, but she couldn't find him anywhere. 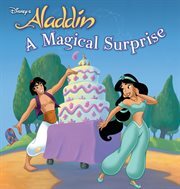 So when the Magic Carpet suddenly appears and takes Jasmine for a ride, all she can think of is Aladdin. Where could he be? And what could he doing? Don't miss this adorable story as Jasmine searches for Aladdin on a seemingly ordinary day!